When we rolled into the studio this morning, we each arrived with a little something for today’s lunch. One brought three handsome red bell peppers and the other brought one pound of beautiful ground lamb. 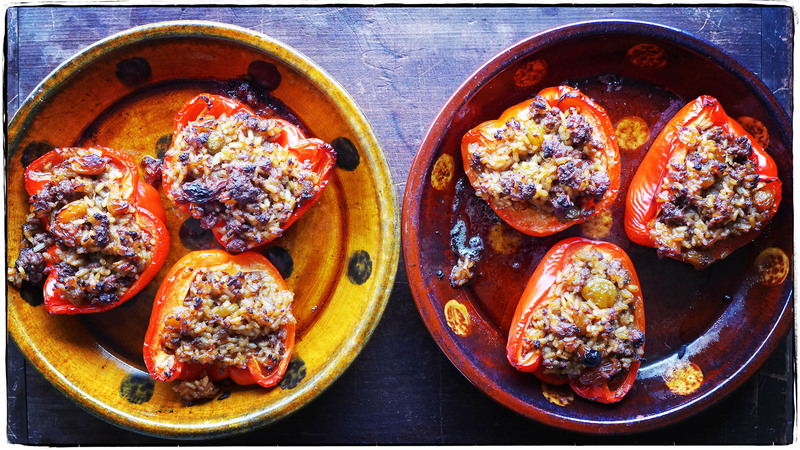 So lunch was decided for us—lamb and rice stuffed peppers. We added onions, golden raisins, cumin, and coriander to twirl the dish up. It was the perfect thing to eat on this cold day. Afterwards, we took Bob, the new studio dog, for a walk around town and looked at how people have decorated their houses for the holidays. Maybe we’ll both get around to buying Christmas trees this weekend. Gotta get in the spirit of the season!